Buster is kicking off 2017 with exciting news! You may have noticed the new look, and it is more than meets the eye. Whether you are a frequent Buster booker or were just introduced to the site, there are some new features that are sure to make your trip planning a breeze. Back when Buster was a wee little roadster, it had big dreams of breaking down the barriers of the charter bus industry and shepherding it into the digital age. The company was established in 2012, gained momentum in 2015 with its operator partnerships and investments, and went national in 2016, so fasten your seat belts because Buster has a lot in store for 2017! New logo, new look, new easy-to-read results page, new lower pricing, and tools that will solve your booking woes. As many of you may already know from booking ground transportation, the pre-Buster industry was stuck in the dial-up days in terms of technology. It could turn into a full time job with all the calling, leaving voicemails, waiting for e-mailed quotes, and reconfirming trip details. Even if you were lucky enough to actually speak with a human, there were still irrational pricing discrepancies and hidden fees leaving you confused and exhausted from the process. 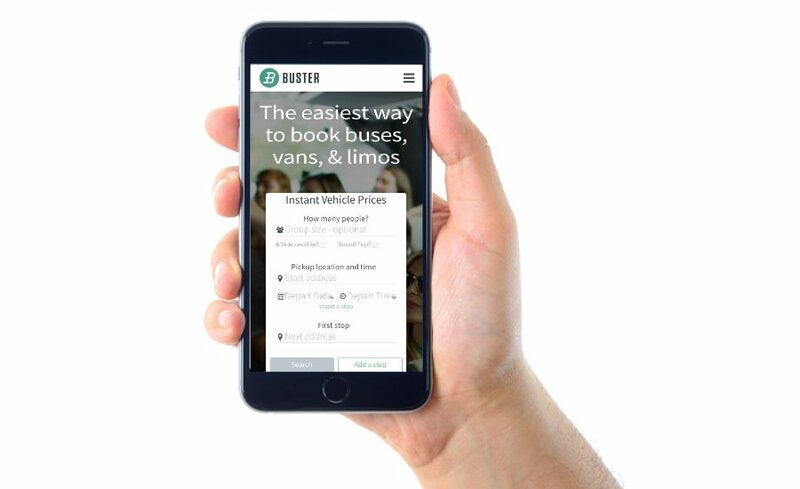 Buster is an online booking platform for group ground transportation – think Expedia for buses, limos, and vans. Operators across the U.S. input their fleet and pricing information, and the Buster booking platform works its magic to give you instant vehicle options and pricing that match your specific itinerary. No more cash, quote forms, or phone calls necessary. From shuttling options to mobile friendly technology – your voices have been heard! Your experience with Buster is what helps shape the direction of the website, and the team is working hard to put those features and functionality in place so you can overhaul the way you book travel – saving an incredible amount of time and money. Buster’s new look fits in well with the service it offers – a streamlined approach to helping people mobilize. Whether you are a professional wedding planner or the friend that volunteered to organize a trip to the game, you can begin your search with the same tool at buster.com/plan. Brides and Grooms – not so sure where to begin planning shuttles for your guests coming from different hotels at various times? The shuttling tool is getting its finishing touches in the shop and will give you a sigh of relief when you can build out those more detailed trips all online, even from your phone if you prefer! That technology is revolutionary in the online travel industry, so stay tuned for the announcement of that feature and follow Buster’s social channels to keep up with the evolution of the platform.